I have a weird obsession with fruit-printed things. Especially when they’re launched around summertime. Naturally, the retail gods have figured this out and are launching all sorts of fab fruity gift ideas. Come covet with me my friends – this one’s a juicy post. Lemon Print Full Skirt – $95 @ Banana Republic: Vintage botanicals are hot hot hot right now, which makes sense since they’re a refreshing contrast to the pending hot hot hot weather we’re hopefully going to have. Picnic Person Dress – $109.99 @ ModCloth: A classic gingham print is offset by a bold watermelon slice lapel. Could there be a better dress for a summery afternoon outing? Fruit Measuring Cups – $24 @ Urban Outfitters: If you have one of those kitchens that demands displayable dishes (read: glass cabinets) than these funky, fruity ceramic measuring cups are a perfect addition to your cupboards. TONYMOLY Peach Anti-Aging Hand Cream – $4.99 @ C&C Canada: Hailing from Korea, this peach-scented hand lotion is ultra-moisturizing, and also whitening (if you care about such things). Totally Tutti-Fruity Sandal – $99.99 @ ModCloth: I simply couldn’t resist these vintage-inspired, Chiquita Banana-esque sandals. Don ’em with your fave jeans and a tank for an easy summer look, or pair them with a cute maxi dress for an extra splash of summer. Easy Cherry Canvas Tote – $12 @ Forever 21: Get in on the fruit trend without breaking the bank. This casual cherry-printed tote is great for the beach, brunch, and everything in between. Pina Colada Dress – $59 @ Varga: One of my fave LA boutiques carries a line of cherry-printed summer dresses, as well as this fab find – a cute-as-pie pineapple-emblazoned pick. BONUS ENTRY into this month’s Lazypants giveaway: tell me which one of these fresh fruit stand finds you’d most love to own or gift. 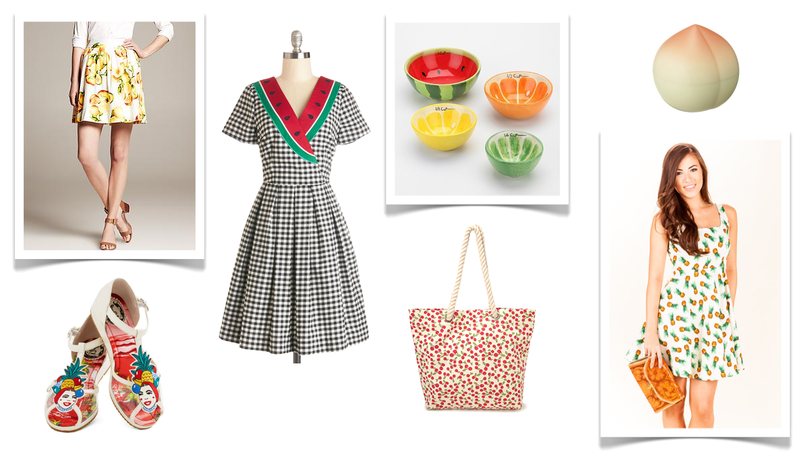 I like the Fruit Measuring Cups and the Picnic Person Dress, too. I would wear the lemon Print Full Skirt – $95 @ Banana Republic: Very summery! I like the fruit measuring bowls, and the cherry purse. Everything else seems a bit much. I could use the Tonymoly Anti-Aging Hand Cream. I’d love to have the cherry tote. Picnic Person Dress is so cute! I think the Fruit Measuring Cups are my favourite! I would love to get the Fruit Measuring Cups! I actually have the TonyMoly peach hand cream! Lol! I love the sandals though too! Fruit Measuring Cups are so cute! I like the Fruit Measuring Cups! Lazypants bonus entry: of these fresh fruit stand finds, I’d most love to own the “TONYMOLY Peach Anti-Aging Hand Cream – $4.99 @ C&C Canada” … sounds wonderful! Those Fruit Measuring Cups are cute!